Motorhome Hire Pembrokeshire, Pembroke, Haverfordwest, Pembroke Dock, Tenby, Neyland , Fishguard, Saundersfoot and more! Pembrokeshire or Pembroke is a county in southwestern Wales, bordered by the counties of Ceredigion to the northeast and Carmarthenshire to the east, while the Bristol Channel encloses the county on the south. The rugged coastlines create numerous protruding headlands including St. David’s head which is the most western point in Wales. Aditionally, St David’s is the smallest city in the United Kingdom. The county town is Haverfordwest. Pembrokeshire was once a bustling hub of Bronze and Iron Age culture, and the north-western portion of the county contains a wealth of megalithic remains like dolmens, stone circles and standing stones. Warrior’s Dyke, a crumbling prehistoric earthwork, still stands on the cliffs of St Davids Head while tombs and hut circles indicate early Iron Age settlements in the south. The region once formed the Welsh area of Dyfed which was easily swayed by the Princes of South Wales while the coastal towns fell to Scandinavian pirates. Today one can see numerous Scandinavian place-names. The Normans established dominion over the southern Dyfed by building Pembroke Castle in 1090. Today the county is primarily rural and is a great spot for vacations of all durations. According to Lonely Planet, Pembrokeshire Coast Path is one of the best long distance trails in the world. The vibrant seaside town of Tenby is loved across the UK for its fabulous sea, sun and sand! Skomer Island is a great place to view the largest puffin colony in southern Britain. Ramsey Island holds a wealth of wildlife while Saint Govan’s Chapel is also worth a visit. 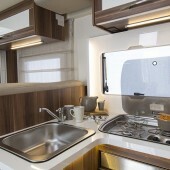 Luxury 6 berth motorhome ideal for couples or families.